From The Lives of the Saints by Archimandrite Justin Popovich. Following the demise of the first Christian, right-believing and pious emperor, Saint Constantine the Great, the imperial throne was occupied by his son Constantius,1 who was inclined toward the impious Arian heresy,2 which blasphemed the son of God. Then a wondrous sign appeared at the holy city of Jerusalem, putting the impious heretics to shame, but convincing unbelievers and strengthening the Orthodox. During the days of the holy Pentecost, on the seventh of May at nine o’clock in the morning, the Venerable Cross of the Lord appeared in the heavens. It shone with an ineffable light more powerful than sunlight. All the people, both believers and unbelievers, beheld the celestial sign with fear and amazement. The Venerable Cross stretched above Golgotha3 all the way over to the Mount of Olives,4 fifty stadia5 distant from Golgotha. The breadth of the Venerable Cross matched its length. And the beauty of the Cross was like the beauty of the most beautiful rainbow, and it drew the gaze of everyone to itself. And everyone abandoned their manual labor and household chores and went outside, and watched with fear and trembling. Moreover, huge crowds of Jerusalem’s inhabitants, filled with fear and joy from the divine vision, rushed into the holy church with great reverence and zeal. Here were found the old and the young, men and women with infants, likewise also unwed virgins, men of every stature and calling, wayfarers and foreigners, Christians and people of other faiths — they all rushed to church, and with one soul and a thunderous voice they glorified Jesus Christ our Lord, the only-begotten Son of God, true God of true God, the maker of great miracles. And then the unbelievers and heretics, the enemies and blasphemers of Christ’s Divinity, were filled with shame, since they saw such a great display of the divine glory and power of Christ the Lord in the manifestation of the Cross. 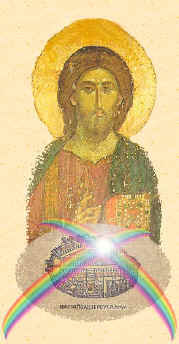 And thus at that time creation itself testified that the Christian faith was the correct, true and devout faith, and was not composed of clever words of superficial human wisdom, but rather was established by the revelation and power of the Holy Spirit and was attested to by heavenly signs and miracles. The Patriarch of Jerusalem, Cyril,6 wrote a letter to the emperor Constantius about this miraculous sign, admonishing him to convert to Orthodoxy. And Sozomen writes that on account of this appearance of the Holy Cross in the heavens many Jews and pagans believed and came to worship Christ our God and receive holy baptism. And they all piously glorified Christ our God, one in essence and co-eternal with the Father and the Holy Spirit. And so we, confessing His unconfessable power, made manifest upon the Cross, magnify the Lord our God with our praises, and bow down before the footstool of His feet — the Holy Cross — entreating the Lord’s kindness so that, at His dread second coming, Christ the Lord may make us worthy to behold in the joy and hope of salvation the sign of the Son of Man (Mt. 24:30), the Holy Cross, which will appear in the heavens at that time, and so that He may open the gates of the heavenly kingdom with it as with a key, as He once opened paradise to the thief, and that he may number us among His blessed sheep forever. Amen. This appearance of the Venerable Cross took place on May 7, 357 A.D.
1 Constantius, the son of Constantine the Great, received the East, Asia and Egypt after his father’s death. After he defeated Magnentius, the murderer of his brother, Constans, in 352 A.D., he united the whole Roman Empire under his rule. He tore down pagan temples, and on several occasions issued laws which prohibited paganism. But through his inclination toward the Arians, he increased the religious strife of that time. He persecuted the Orthodox bishops, deposed them, and then sent them to prison. He died in 361 A.D. St. Gregory the Theologian writes that before his death Constantius regretted that he had persecuted the Orthodox. 3 Golgotha lies on the northwestern side of the Holy City, and was formerly located outside Jerusalem (Mt. 27:32-33; Jn. 19:17, 41; Heb. 13:12). 4 The Mount of Olives is located to the east of Jerusalem (Ezek. 11:23). It received its name from the numerous olive trees which grow on it. Christ the Lord often withdrew to this mountain with His disciples. The Garden of Gethsemane is located on the western slope of the Mount of Olives from where the Lord ascended into heaven. 5 [Translators’ note:] Fifty stadia is the equivalent of a little over five and a half miles. 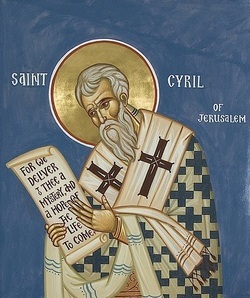 6 Saint Cyril, the archbishop of Jerusalem, was patriarch from 348 to 387 A.D. He was a famous champion against the Arian heresy. He is commemorated on March 18.